So I was pretty bummed when I realized I might be missing out on my gluttonous fill of appetizers (cheerfully dubbed “pupus” in Hawaii) at our own wedding, since we’ll be taking pictures during the cocktail hour. So many mini things I won’t get to snarf! I’m contemplating getting someone to just hoard one (okay, two, okay, three) of all the appetizers in a fort of napkins for me (because that will totally look normal), but just in case that doesn’t pan out, I made one of our appetizers at home, to eat to my heart’s content and to share with you all as part of the second half of this series. We picked four pupus to serve during the cocktail hour: a chicken skewer with sesame sauce, pulled duck wontons, mini shrimp summer rolls, and Boursin & caramelized onion tartlets. The tartlets were actually the one appetizer I didn’t try during our tasting, just because I couldn’t imagine how a buttery, flaky-light puff topped with gently toasted Boursin cheese and jammy caramelized onions could possibly be bad — but B2’s parents got to sample it, and his dad (who I’m thinking could be a food writer if he ever wanted to quit lawyering) wrote us that the crust was “light and delicate,” with a flavor that “blossomed over two or three seconds.” For all I know, the ones we get on the day of won’t look anything like these ones I made, but I thought that was a perfect description of this gorgeous combo. For these, I used a half-batch of Izy’s croissant dough for the crust, just because I’ve been dying to try it (those gifs! 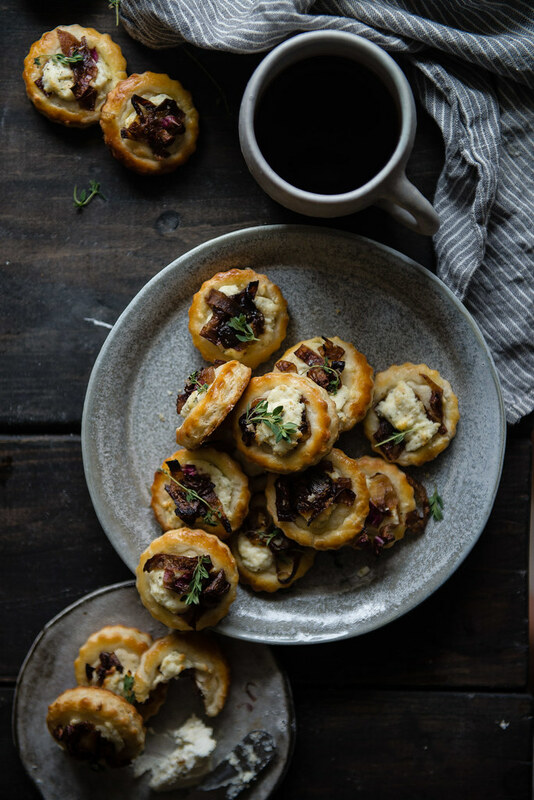 ), but you could absolutely use frozen puff pastry or even your favorite pie dough if you have an extra batch sitting in the freezer. 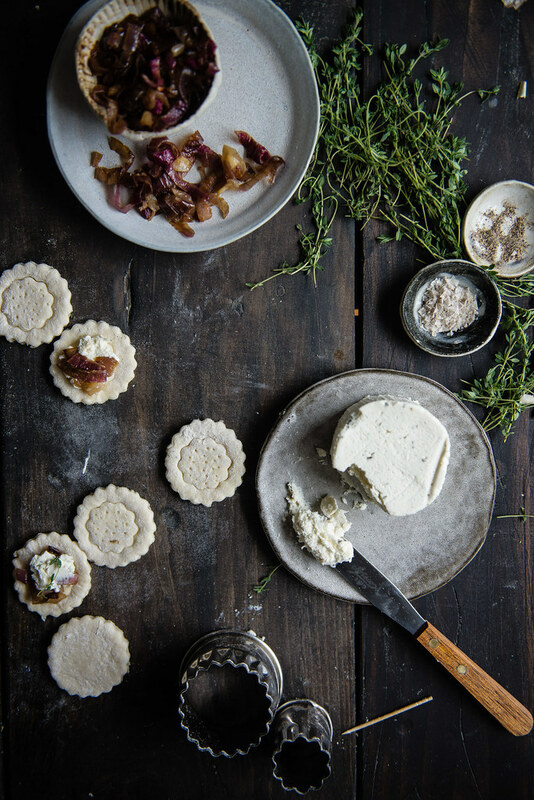 The play between the creamy, slightly pungent Boursin and a tangle of darkly sweet onion, topped off with a sprig of fresh thyme and over a perfectly golden, crackly pastry, was exactly what I was hoping for. For a bit more liveliness to cut through the dairy, I think a drizzle of balsamic glaze (which I meant to do but totally forgot in my excitement to gobble these all down) would have been spectacular. Hope you’re all having wonderful Wednesdays! 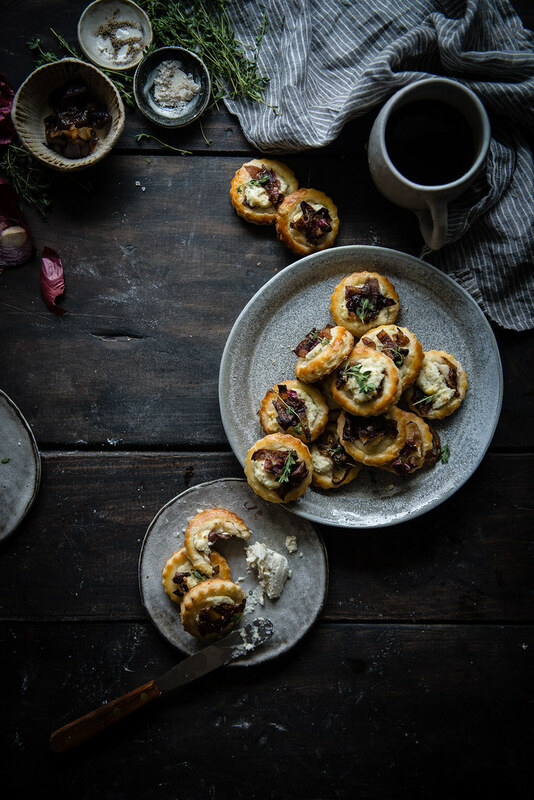 Boursin & caramelized onion tartlets. First, make your caramelized onions. Heat olive oil in a cast-iron skillet over low heat. Spread thinly sliced red onions in a single layer in the pan and let cook slowly, stirring only occasionally, for at least 30-40 minutes and up to an hour. When onions are brown and jammy, add the balsamic vinegar and cook a little longer. Remove from the pan and set aside. Roll out the dough of your choice to about 1/8-inch in thickness. Use a biscuit or cookie cutter to cut rounds to your desired size. 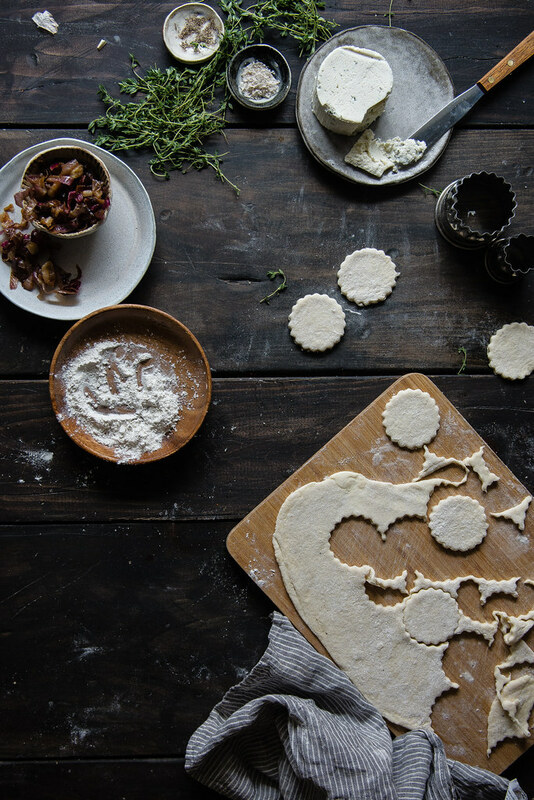 Using a smaller cookie cutter or a knife, score a circle inside the pastry without cutting all the way through, then prick holes in the center circle with a toothpick or fork. 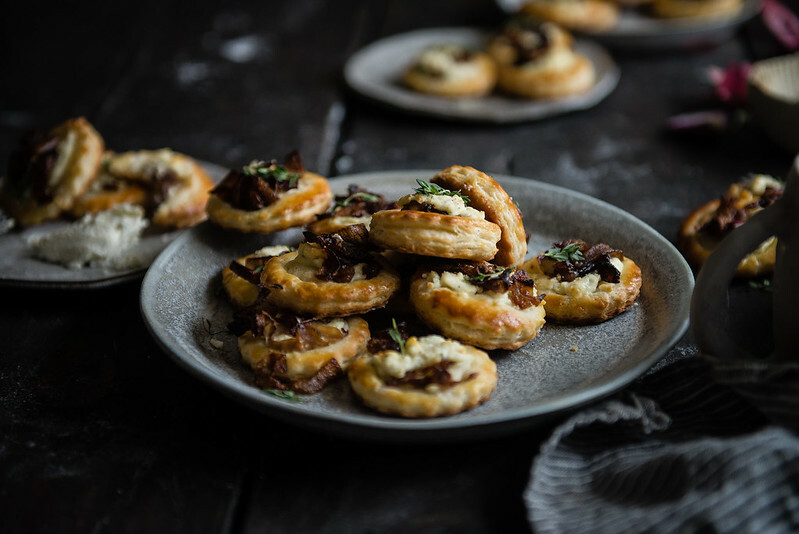 Top each round with a teaspoon of Boursin and a few slices of caramelized onions. 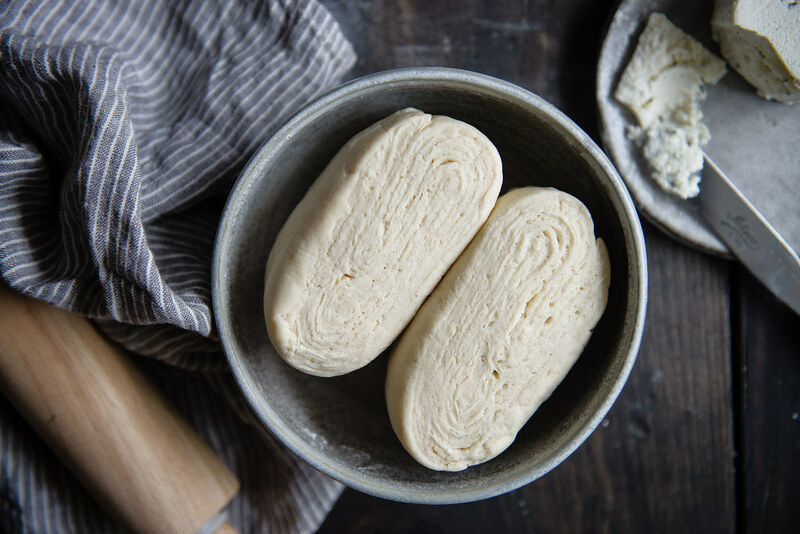 If you're using croissant dough, let the rounds sit and rise for about two hours. 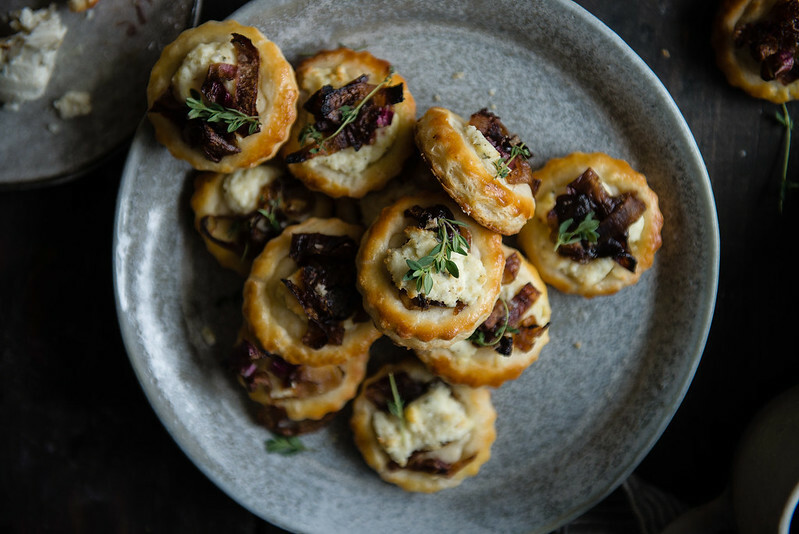 If you're using puff pastry, go ahead and preheat your oven to 425 degrees. Using a pastry brush, brush the edges of the rounds with beaten egg, then bake at 425 for about 15 minutes, or until golden. Optional: Make a balsamic glaze by combining balsamic vinegar and brown sugar in a small saucepan over medium heat. When mixture simmers, turn the heat down to medium-low or low and let bubble until reduced by half, about 10 minutes. Remove from heat and let cool briefly. 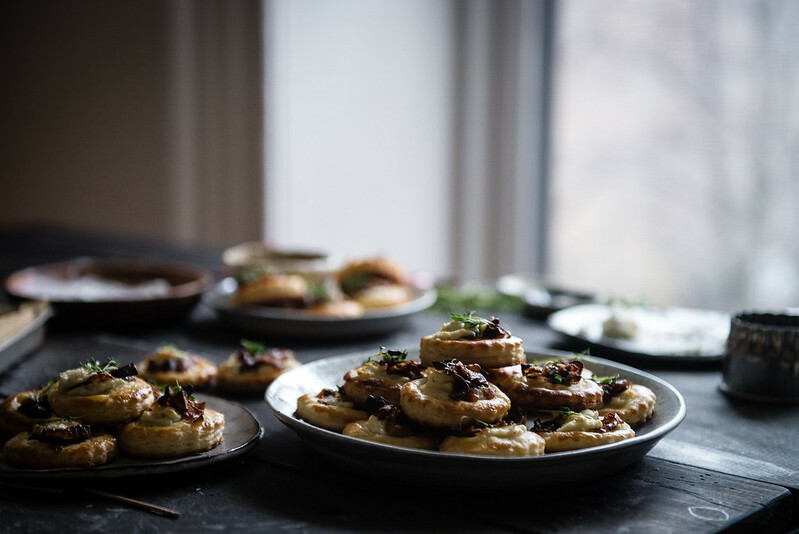 When the tarts are golden and puffed, top with small sprigs of fresh thyme and a drizzle of the glaze, and serve warm. Enjoy! OH mini food this the best. 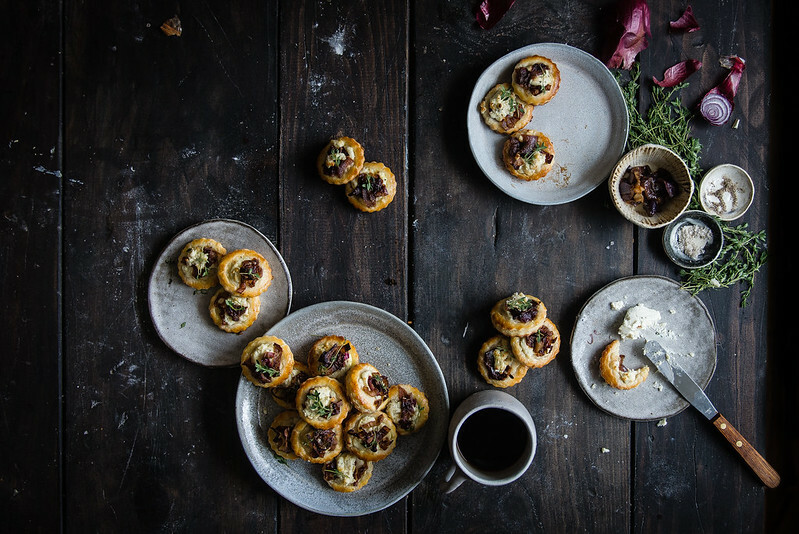 I love mini tacos as canapés! I had them once at a friends reception and they were the bomb. 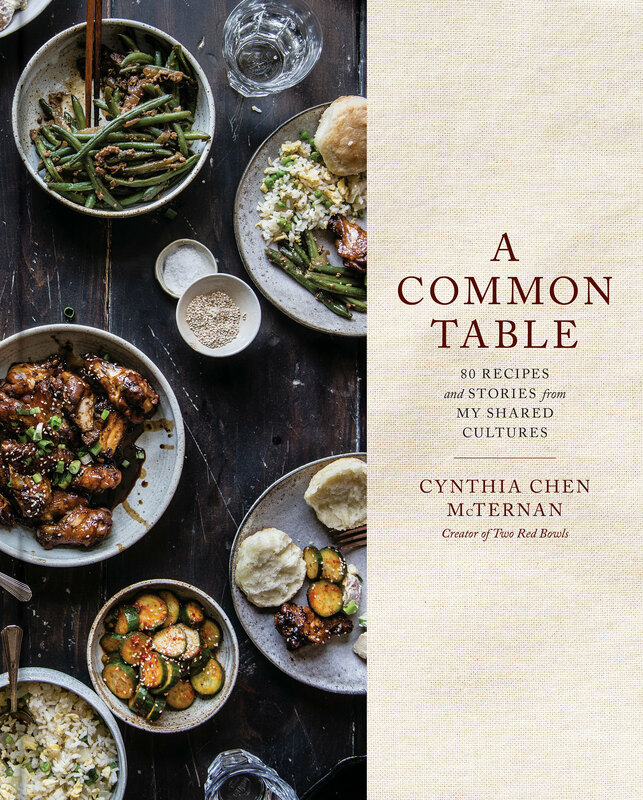 I really hope you get the chance to taste the wonderful food; I second getting a friend to hoard some of them for you. Trust me, I have lived through two weddings as a brides maid and even the wedding party doesn’t get to eat or sit for a second. OMG you are my HERO!! I’m totally going to emulate you. I’m already excited. And yes, oh my gosh, Izy’s croissants were amazing — totally doable, I promise! My newbie croissant puffs didn’t have as crisp or as many layers (which was totally me and not the recipe) but they tasted absolutely incredible. She’s a goddess. I dread to think of how many I ate!! Haha 🙂 Thanks so much for the super sweet words, Sophie. Lovely Cindy and congrats on your recent award!! Thank you so so much, Hung! You are so kind. Umm, so I am sure you hear this a lot, but you are kind of amazing!! Also, you mini apps are so perfect! Love that you made you own dough and I mean, the sound of these?? Incredible!! Croissant dough?! I’m sure your guests will be thrilled. I’d like to devour a plate-full of these for breakfast. At our wedding, the coordinator pulled us away for the five minutes directly following the ceremony, to spent a of couple (air conditioned) minutes alone. She brought us a plate with two of each of the hors d’oeuvres, plus glasses of chilly water and champagne. If you can swing it, I highly recommend this. I love that you are sharing wedding bites here! I love love love appetizers, which is why we are foregoing the usual dinner and having lots and lots apps/cocktails! Sooo if you are in the Milwaukee area in November come on over! AH, these look perfect! Your wedding is gonna be fantastic, I’m sure. Also, b2’s dad sounds super adorable lol. 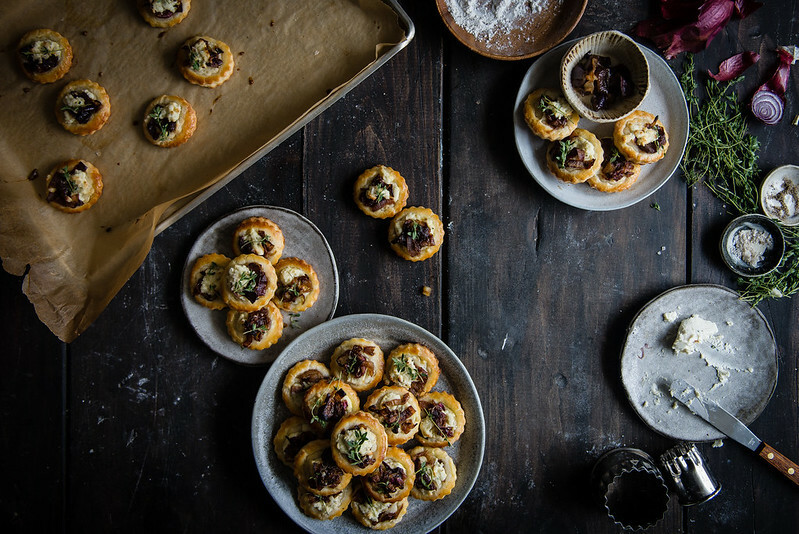 These look amazing, but uh.. please tell me you’re going to make pulled duck wontons, because then you will forever be my hero!!!! P.S. The way B2's dad described the tartlets is the best!! Ahhh I’ve been wanting to master croissant dough but I’ve been telling myself I need to take a week off of work to do it. (Wishful thinking!) What lovely pupus you have chosen (hehe!) can’t WAIT to see that cake, though! Omg yum! I agree, I like appetizer food too! And your future father in law is cute. He took his job of tasting and describing very seriously! So easy and delicious – and totally doable any time of year! I want this now though. Yum! Oh goodness oh goodness.. so many things.. but first YOU WON!!! 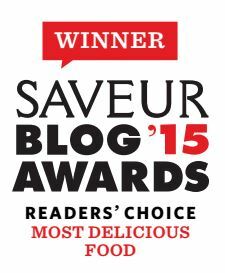 OMG congrats on the Saveur award girlfriend. 2nd- I am That person that always wants the little bites on the spoon.. those spoons are so cute. 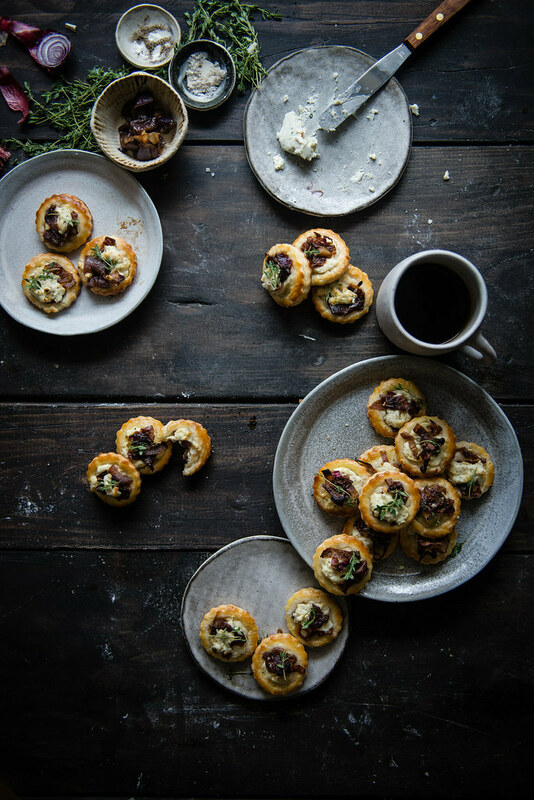 Now these tartlets OMG love love them. I keep seeing those puff pastries as biscuits. 🙂 I’m gonna make these ASAP. These are lovely, balsamic glaze is a good little addition and I love how mini these are! Your wedding will be beautiful for sure. hooray!! i can’t wait to read all about your favors. i am getting married in october and suspect i will look to you for inspiration! Geez, are you sure B2’s dad wasn’t a secret fan of Nigella Lawson? These look wonderful! I could probably tuck into the entire plateful! My wedding is over a year away, but I’m already worrying about missing the canapés for photos. These things are very important aren’t they! We’ve decided to have extra canapés instead of a starter too – additional food related pressure! Maybe we’ll just snap off a couple of quick shots and dash back. Memories of the food are surely just as important as pictures of me in a dress?! Or get someone to stash someone in a napkin like you say, I’m not above that kind of food hoarding at all! Without doubt, choosing canapes was my fave part of wedding planning. We had an entire evening with our caterers where they fed us wine and lots and lots of little nibbles. It was so hard to narrow down our choices (and now I’m having total canape envy of yours!). love those scalloped edges. 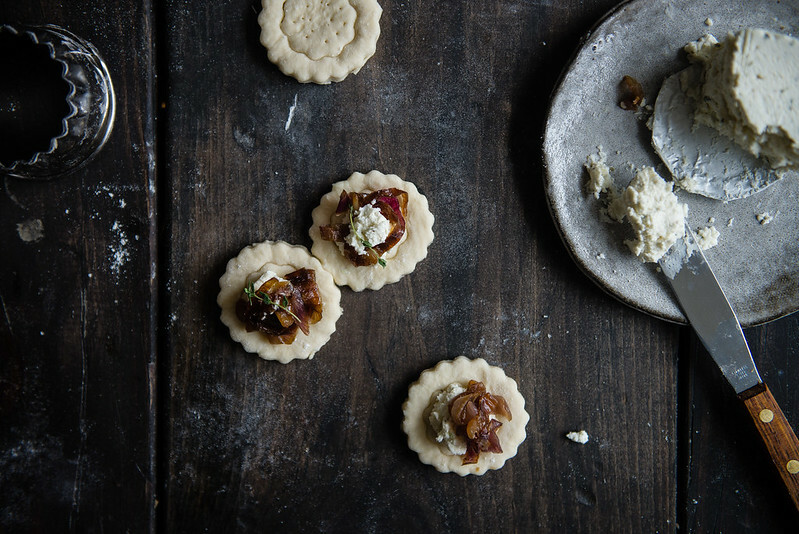 totally admire you for making your own wedding appetizers! making a mental note (and pinning!) to make these at my next party. I am obsessed with these – mini eats are the best cuz then I can eat like 12 of them. I’ve always seen balsamic glazes in bottles at the store, but cool that i can just make it on my own! You totally earned the right to hoarded plates at your own wedding, girl. 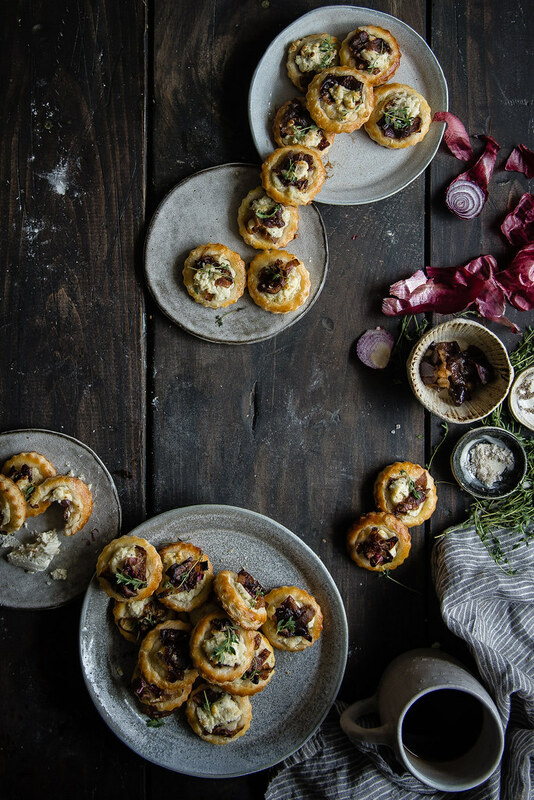 Genius idea to go through and make your own appetizers. I, too, am the plate-juggling sauce person in the corner. Cheers, love this series and all the stories! 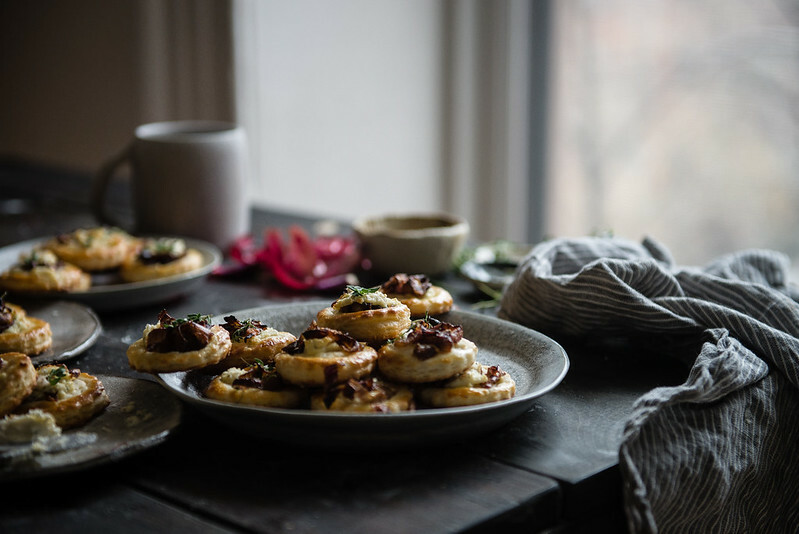 I’d absolutely inhale these tartlets – I love caramelized onions and everything is better in mini size! CYNTHIA! Hi. So fun hearing about your adventures via Alana this week. These are absolutely gorgeous, and I’m kinda maybe hoping we can recreate your wedding pupus someday for an IRL blogger meetup? It’ll be like we’re all getting married, but better! I’d also like to request that B2’s dad write a guest post on my blog kthxbyeeeeee. The best thing about mini foods is that you can indulge in a bit more…these make me happy. Happy feasting! Thank you for bringing boursin back into my life! I had temporarily forgotten about its deliciousness (how could I?) until now! I can imagine it must go s beautifully well with the caramelized onions with the the salty playing against the sweet. I look forward tot trying these! OMG THESE ARE SO CUTE!! And B2’s dad?! Hi, he can write my blog if he ever wants to retire. I can’t wait for the rest of this series!! 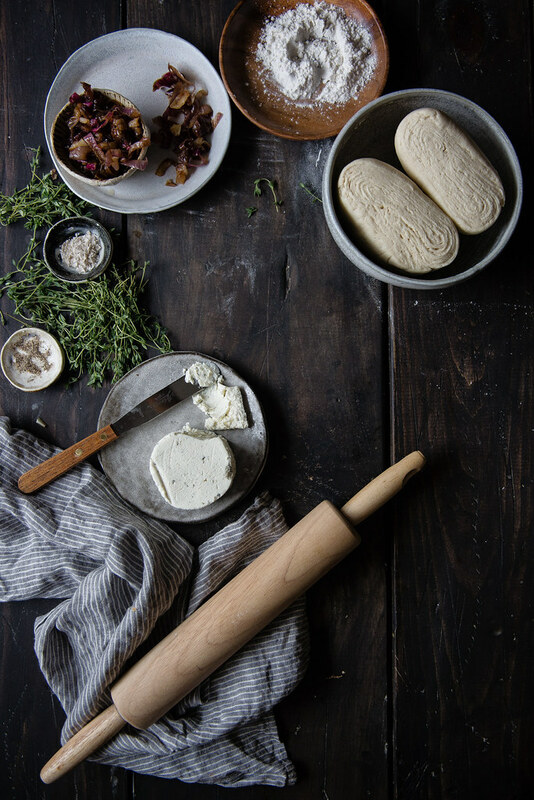 Oh wow – this photography is absolutetly stunning, feel like I’m flicking through a foodie magazine! I’ve scrolled back through all your old posts, i’m addicted!